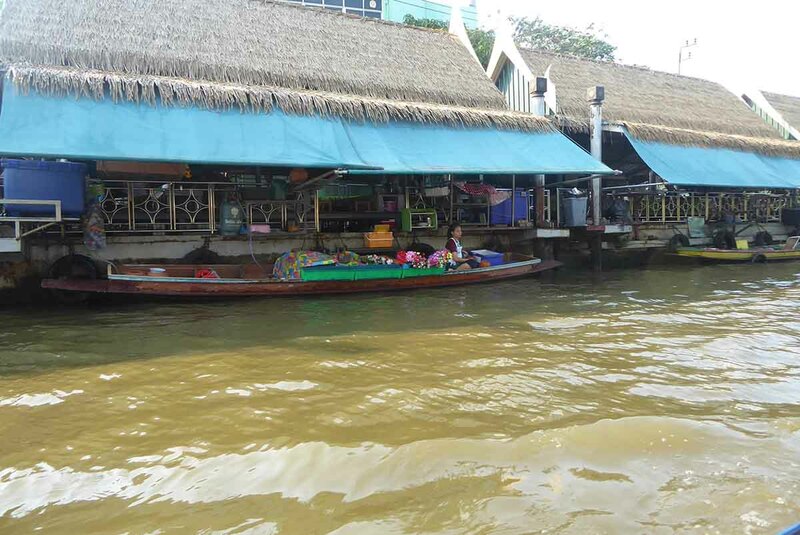 Taling Chan Floating Market is located in Thonburi on the banks of Khlong Chak Phra. 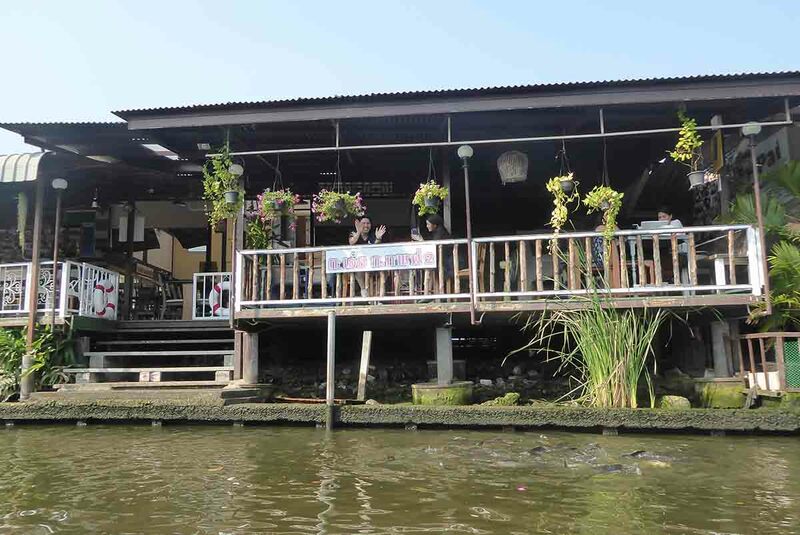 It’s the closest floating market to central Bangkok, it’s not too touristy and is easily accessible by public transport. 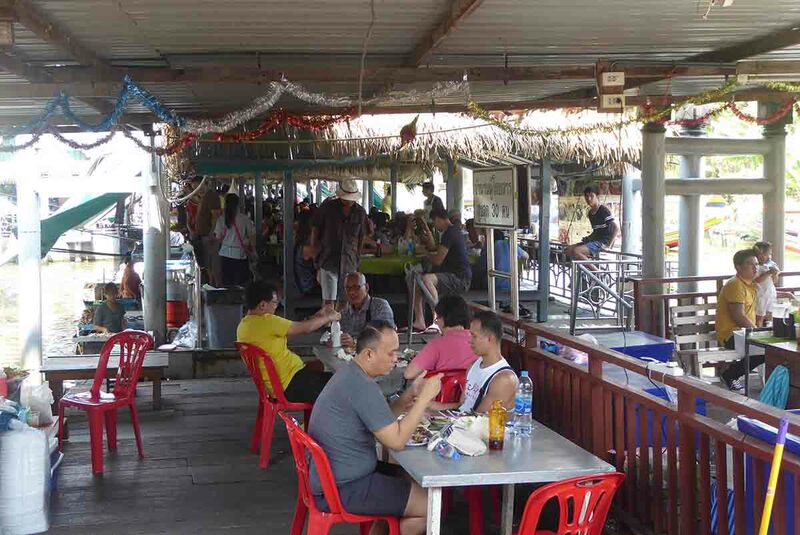 It’s only open on weekends and public holidays and can be busy at peak times. The main activity is dining on the freshly made food, though, there is also a market, live music, massage and boat tours of the local area. 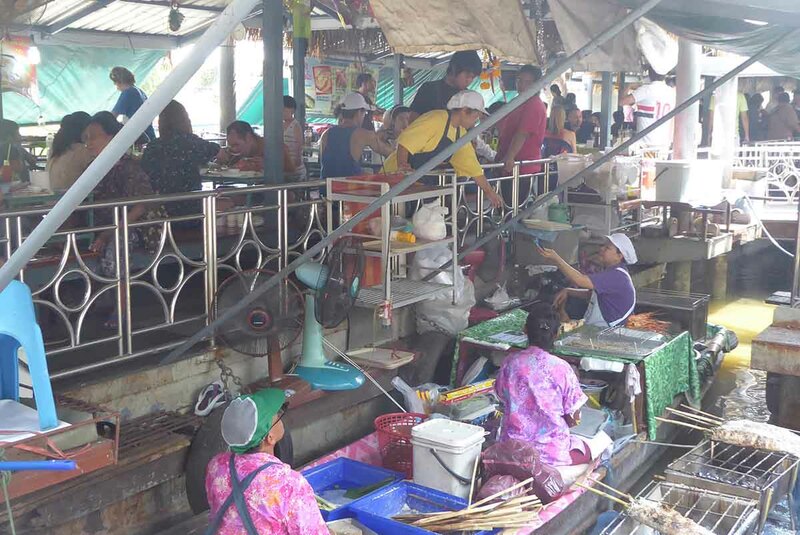 The market is also popular with Thai’s who come to dine on the inexpensive seafood. 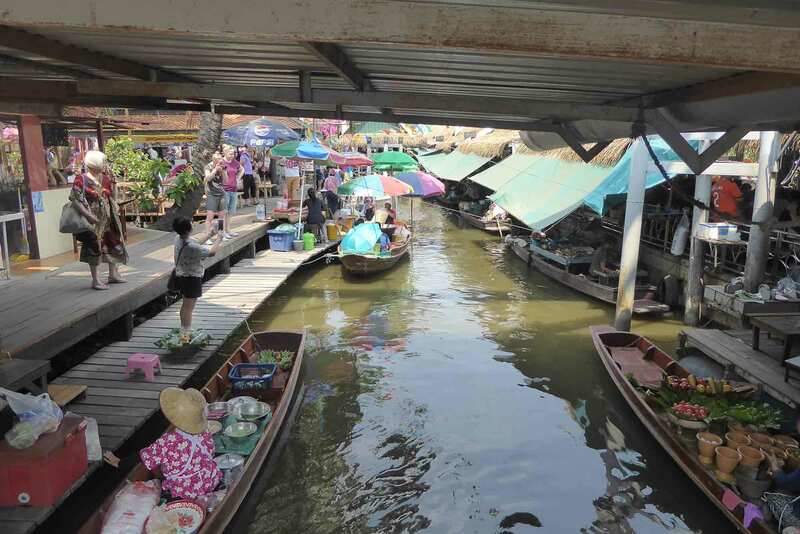 If you plan on coming here it is best to combine the market with one of the long-tail boat Khlong tours (see below) that depart from the market pier so as to get full value for your day out. The market entrance is in front of the Taling Chan district office building. 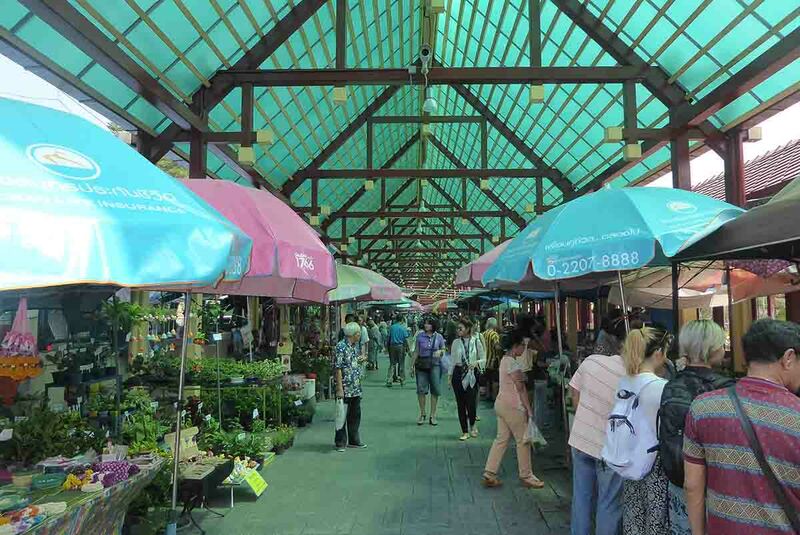 At the entrance, there is an outdoor street market where vendors, some of whom are local farmers sell fresh fruit, vegetables, flowers, rare plants, sweets, snacks, and hand-made craft items. 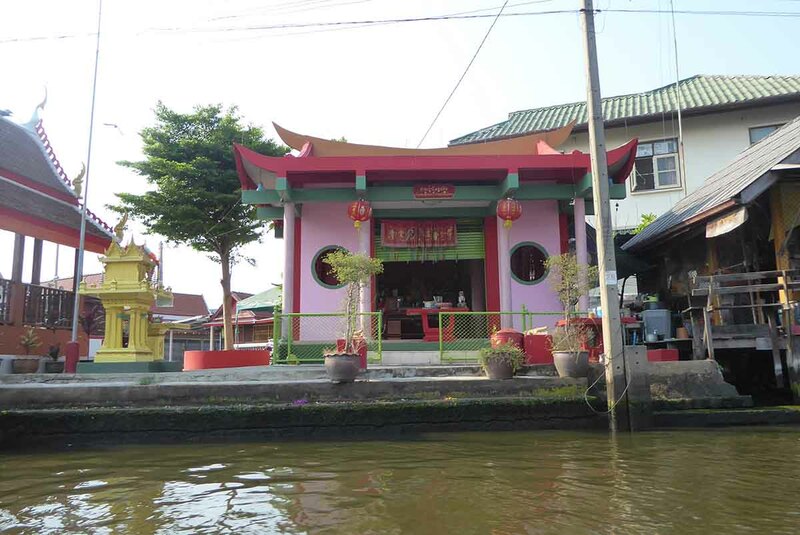 The floating market is just behind, clustered around several pontoons that act as restaurants with either seating on floor cushions beside low tables or regular tables with plastic chairs. 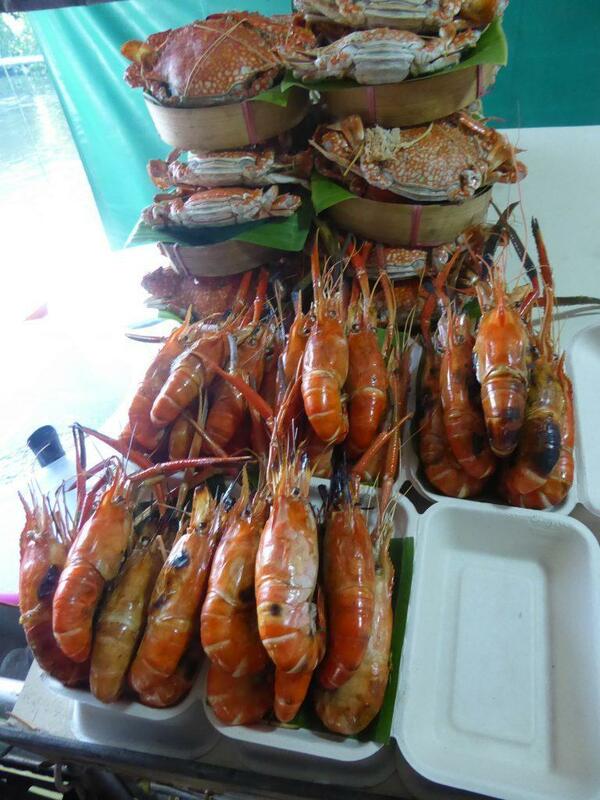 The food on offer includes grilled/steamed seafood, Isaan food, papaya salad, satay, noodles, Islamic food, and Thai desserts. 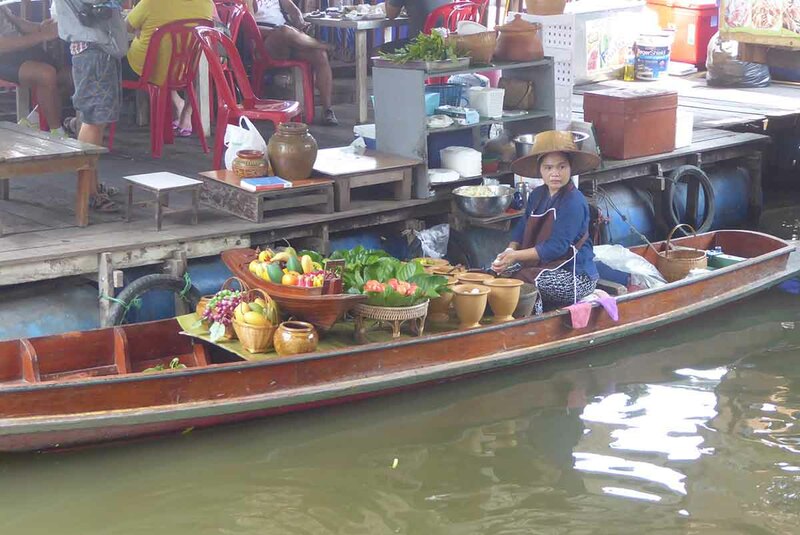 The food is prepared on small floating boats and is not expensive. 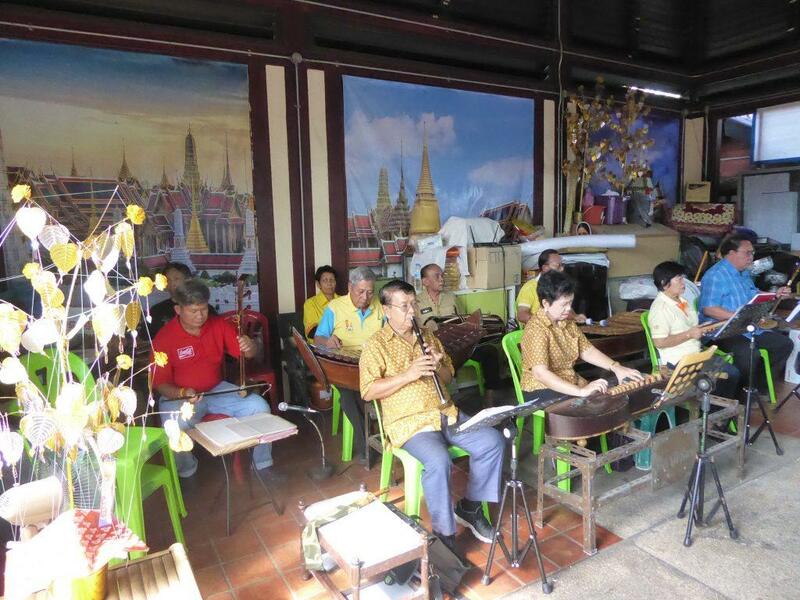 There is also classical Thai music performances and a Thai massage sala. 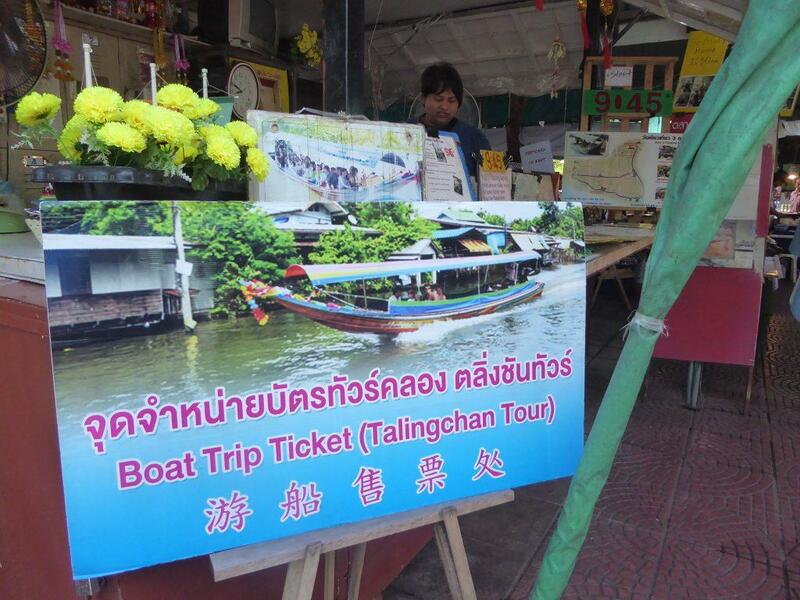 A ticket office next to the Floating market entrance sells tickets for longtail boat tours of the local khlongs. 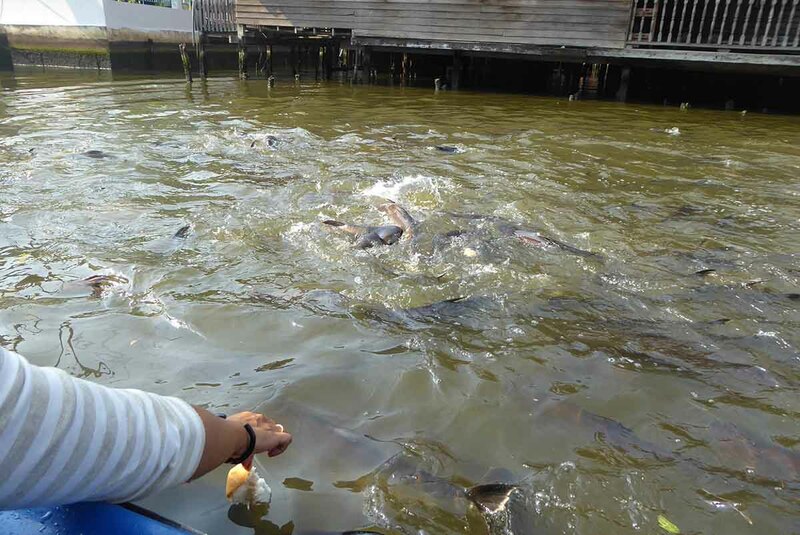 The market is also popular with the huge local catfish who gather around the pontoons hoping to be fed. Bags of fish feed are on sale for 20-30 baht. More food is available from the stalls at the street market. 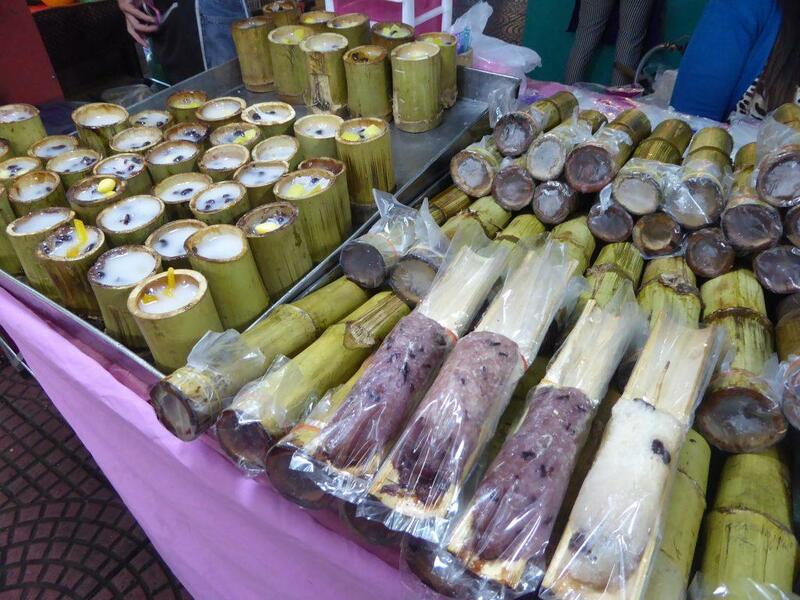 Try the sticky rice in bamboo. It comes with a choice of toppings – coconut, taro, potato, ginkgo biloba & vigna mungo . The market operates longtail boat tours of the local area. There are 4 routes and are good value at 60 to 99 baht per person. 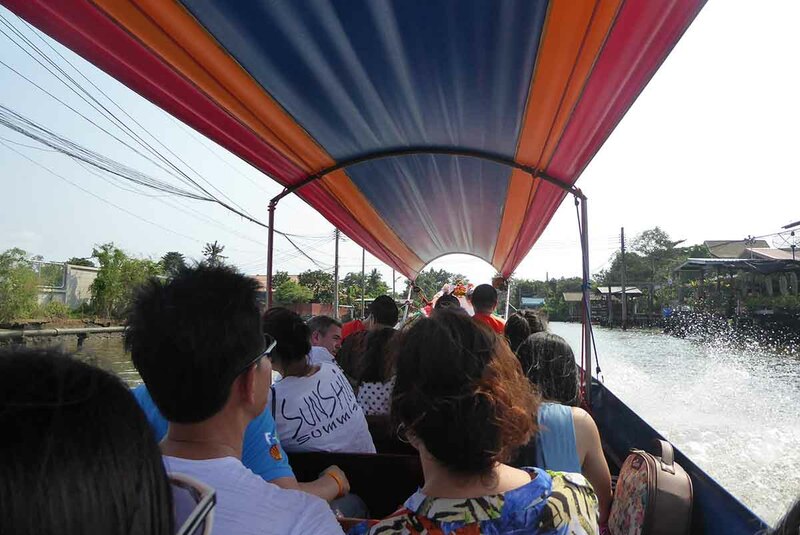 The most popular, route 4, a one hour tour that costs 60 baht with departures about every 30 minutes. 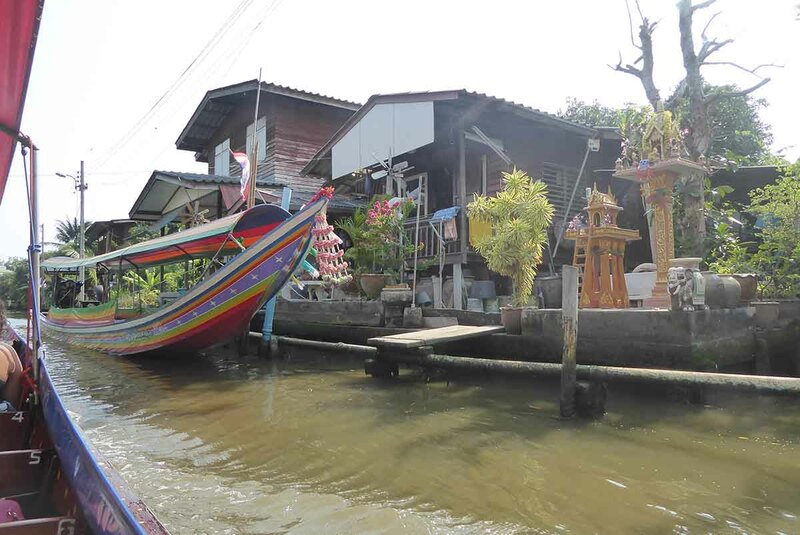 This route follows the Chak Phra Canal and the Bang Chueak Nang Canal allowing you to observe the local canal-side way of life. 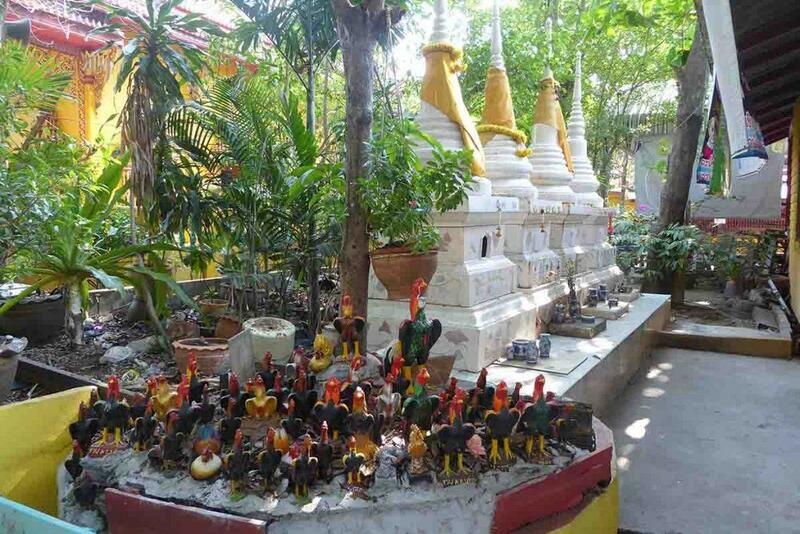 The highlight is a stop at an old canal side temple called Wat Kor which seems to be home for many chickens both real and model. Route one is the longest tour but only departs once a day at 09.30. It lasts for 3 hours and is great value at 99 baht. 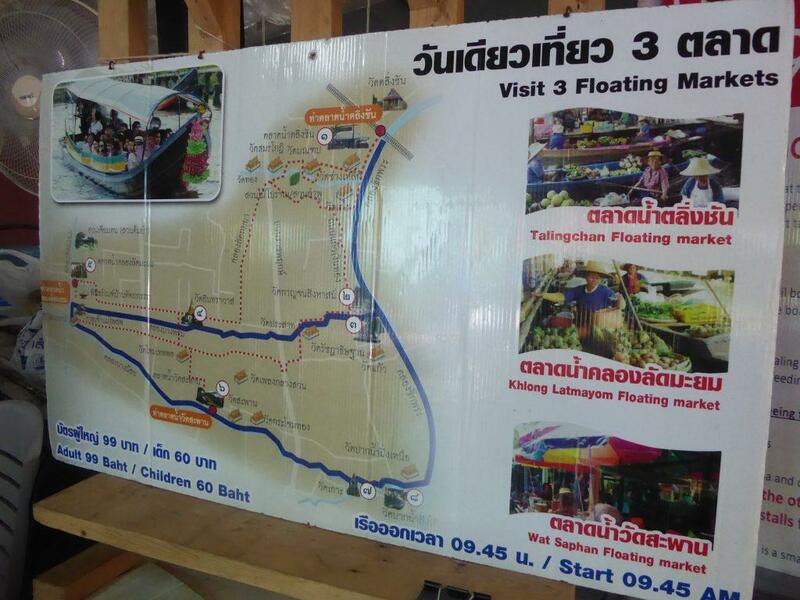 The tour visits Taling Chan’s other floating markets at Lat Mayom and Wat Saphan before returning to Taling Chan. 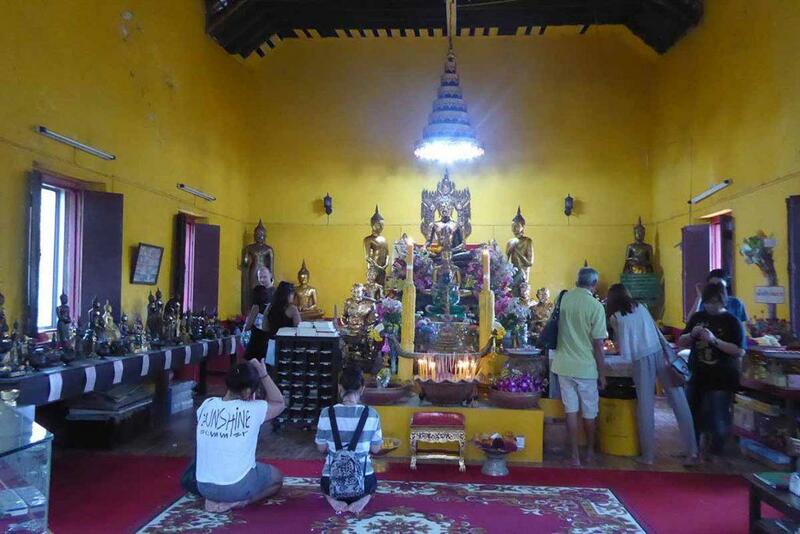 At Wat Saphan, you can see the famous Buddha images, Luang Pho To, Luang Pho Klang, and Luang Pho Dam as well as the ruins of an ancient Ayutthaya period temple. 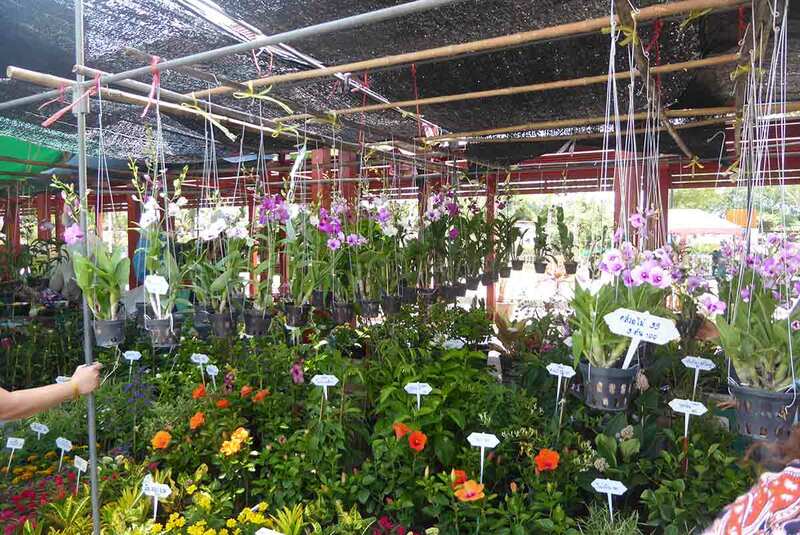 Route two visits Wat Phikun, an orchid farm, and a fruit plantation and lasts for 2.5 hours and costs 99 baht. There is only one departure a day for this tour at 09.30. 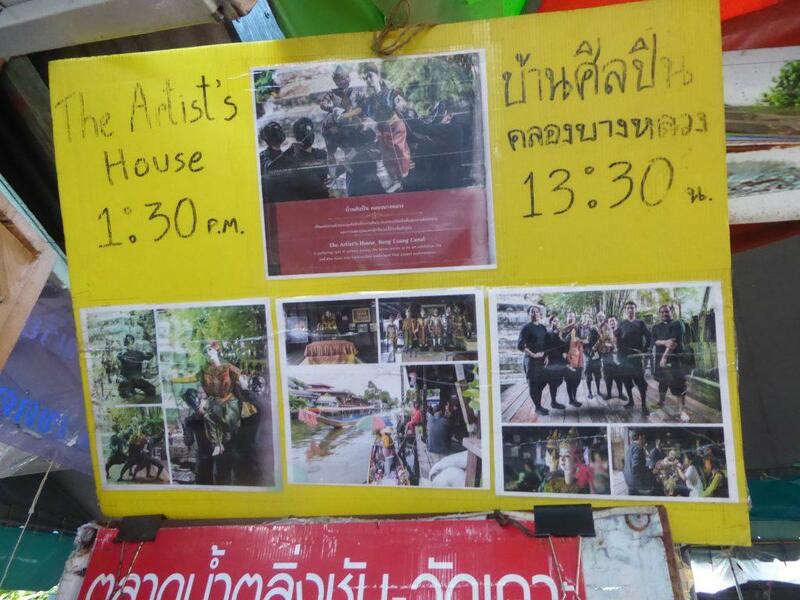 Route three visits the artist’s house (Baan Silapin) which is a 200-year-old restored Thai wooden house on the Khlong where you watch a rare traditional Thai puppet show performed daily at 14.00. 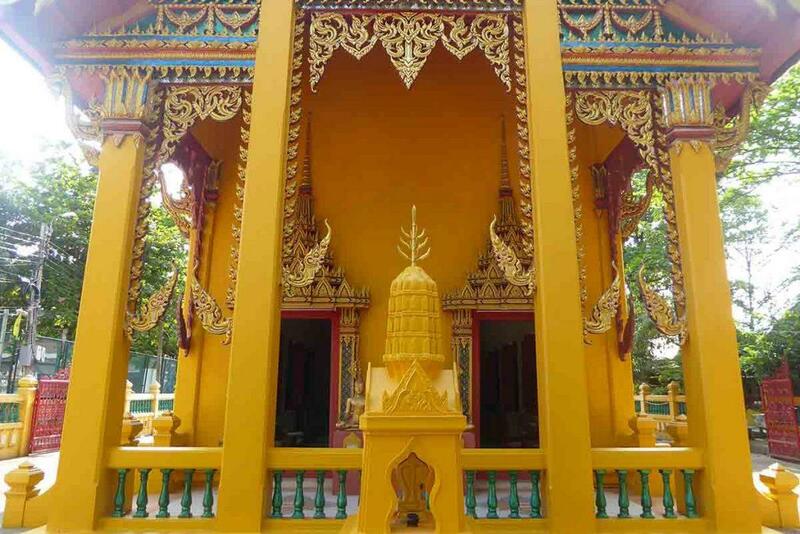 The tour continues to an ancient temple called Wat Kamphaeng Bang Chak which features rare murals and Buddha images. 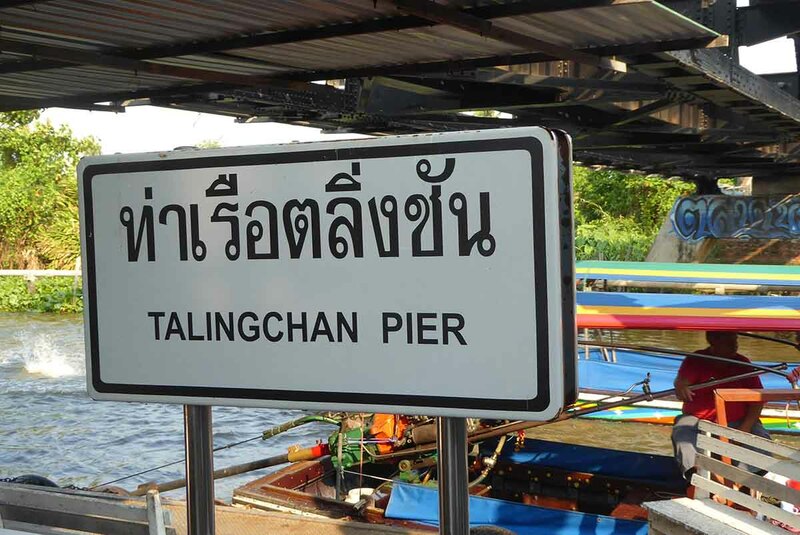 Tour three departs Taling Chan once a day at 13.30 and takes 2.5 hours. 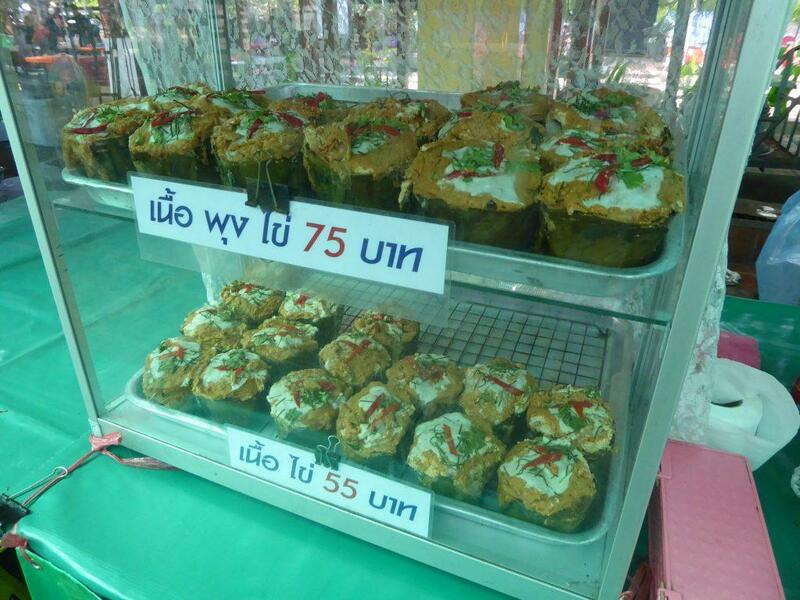 Again, the cost is a bargain 99 baht. 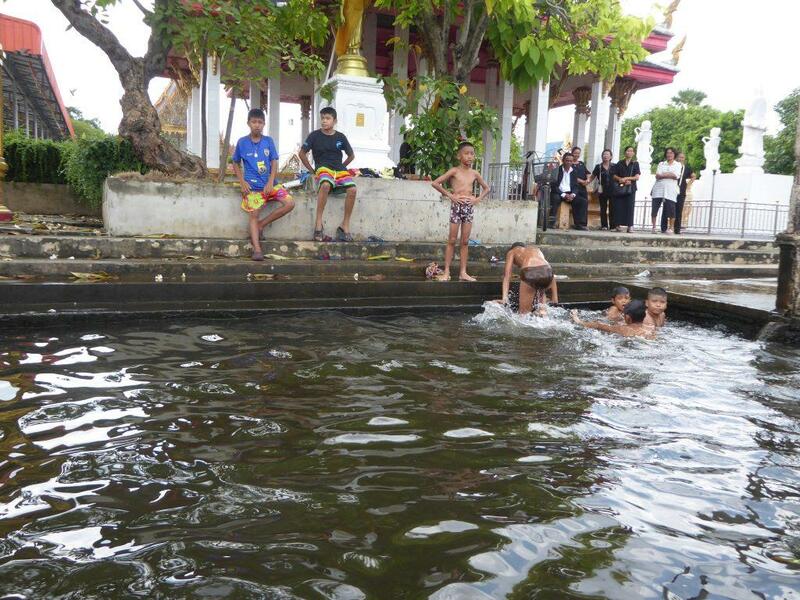 All the tours stop at Wat Pak Nam Fang Tai for you to feed fish if you so wish (20 baht for bread) and at a canal-side stall where you can buy rice baked in a bamboo cylinder (Khao Lam) for 50 baht. All the tours depart from Taling Chan pier within the floating market. 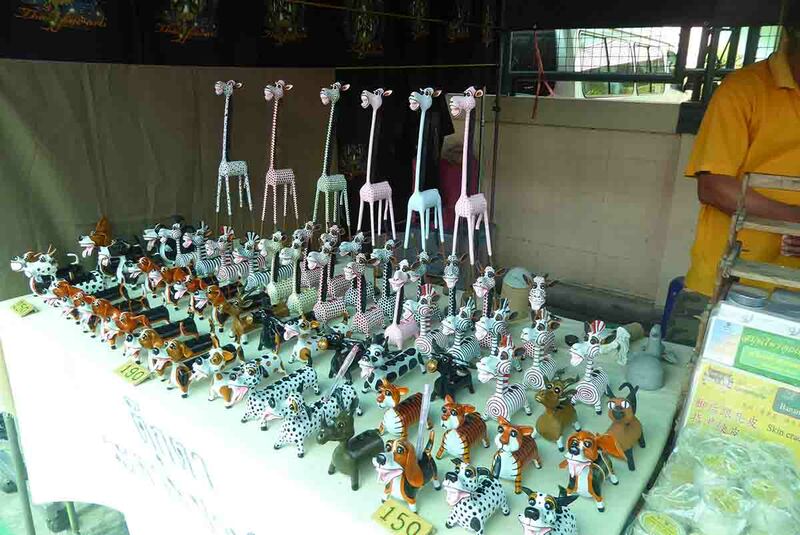 Tickets are sold only at the ticket office at the floating market entrance. All the tours have an entertaining English speaking guide. Tours on Saturday, Sunday and public holidays only. Arrive early if you want to make sure of a place on the boat. 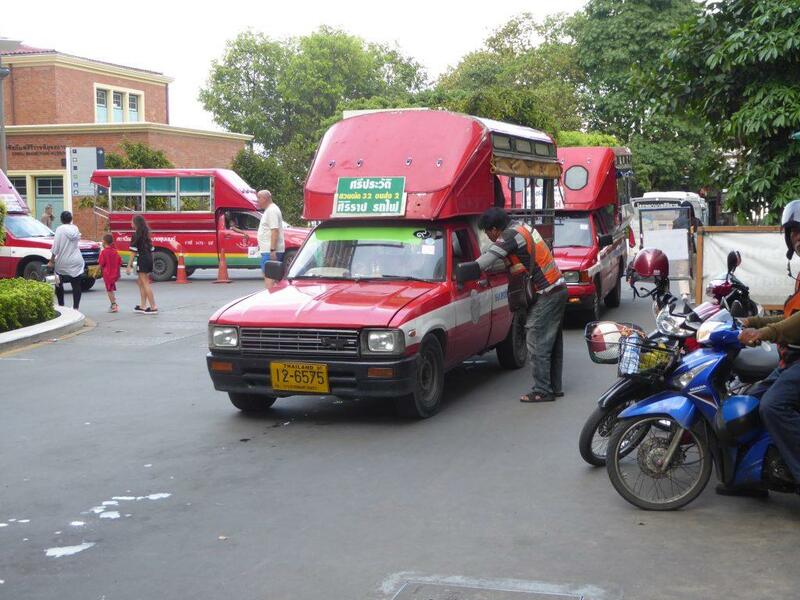 The best way to get to Taling Chan floating market is by bus. The Orange air-conditioned bus 79 stops outside the 7-11 next to the market entrance. The 79 runs past Central World, Siam Paragon, BTS Ratchathewi, and along Ratchadamoen Klang road near Khaosan. 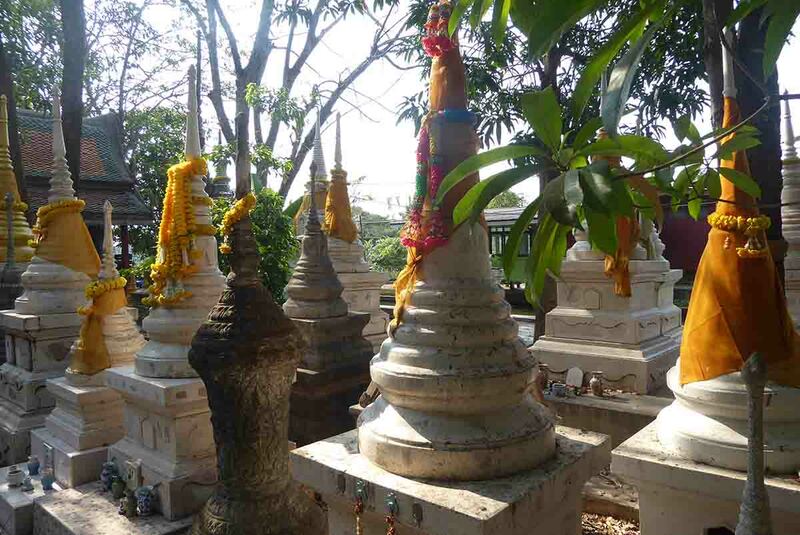 It takes about 45 minutes from central Bangkok and costs less than 20 baht. 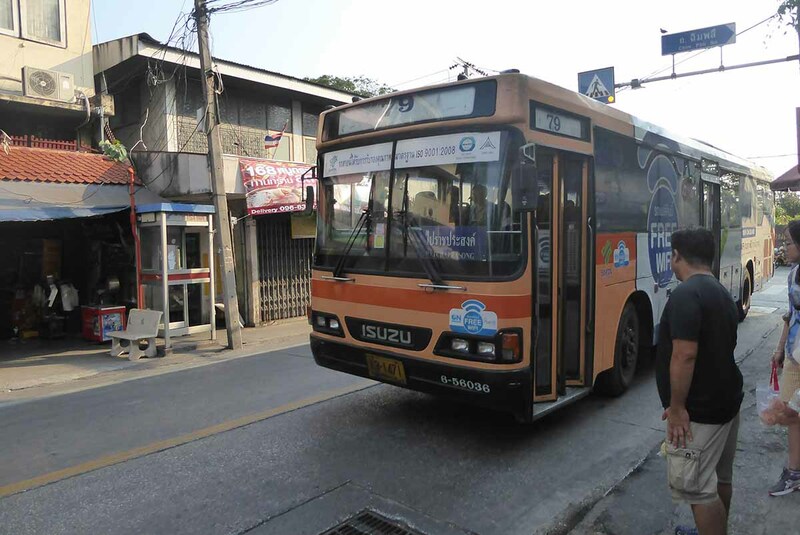 Alternatively, you can take the BTS to Wongwian Yai station and take a taxi from there for about 150 baht or take the Chao Phraya Express Boat to Wang Lang pier (N10) or Thonburi Railway pier (N11) and take a taxi from there for about 100 baht. At Thonburi Railway Pier you can also take a Red Songthaew to Taling Chan for a bargain 15 baht. Catch it next to the motorcycle taxi stand. Be sure to ask the driver first if he is going to Taling Chan as not all go there. Location: Chak Phra Canal. Next to Taling Chan District Office. Opening Hours: 08.00-17.00 Saturday-Sunday & Public Holidays. BTS: Wongwian Yai station, then taxi. 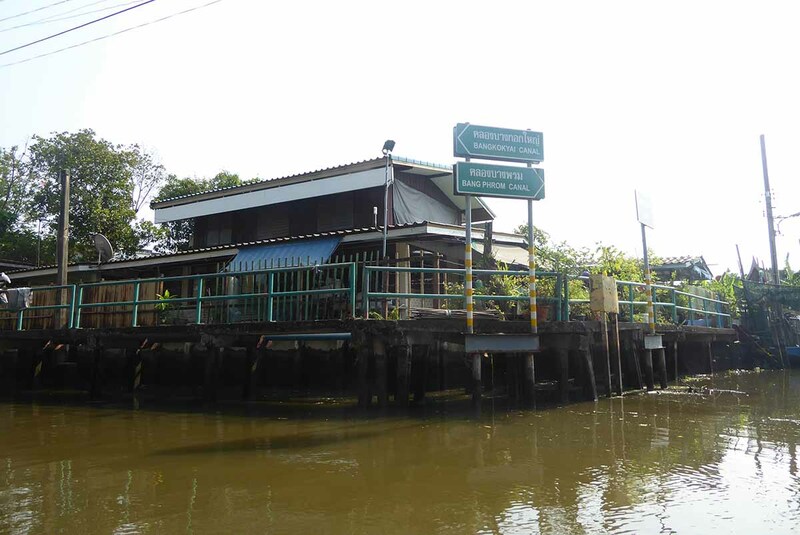 Boat: Chao Phraya Express Boat to Wang Lang pier (N10) or Thonburi Railway pier (N11), then taxi. Songthaew: Red Songthaew from Taling Chan Pier.